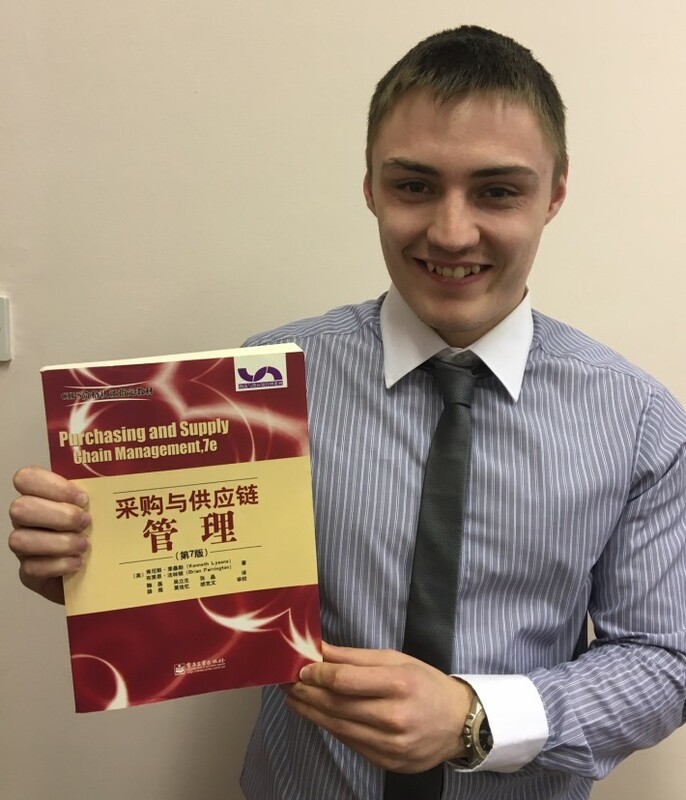 When, Thomas Roughley our latest Work Experience Graduate showed an interest undertaking some background reading as he started his placement, we gave him one of Dr. Farrington’s books to read! We think he was a little surprised with the Chinese Edition, as he was with another version in Russian. However we are not all bad. He did get the opportunity to see a pre-release version of the ninth edition of “Purchasing and Supply Chain Management” in English, which should be on general release next week. We at Brian Farrington Limited (BFL) like to put something back into the community and providing experience for graduates seeking employment is one of the ways we do this. We have a very positive involvement with work experience placements, working closely with Katie Ratcliffe and Chris Anders, Relationship Managers, from the St Helens DWP Job Centre Plus. We carefully design the work experience to the needs of the individual, ensuring that they produce an ‘outcome’ at the end of their placement. Thomas, is a law graduate and is actively producing guidelines related to contractual risk. This requires research, interpretation and writing a report. The report can, in the future, be shown to a prospective employer. The ‘outcome’ is something they can show an achievement to a future employer. Throughout the placement we review their progress, helping identify areas that are strengths and others which can be improved. The realities of work are embedded, at least requiring a structured approach to any task. We encourage initiatives and avoid putting the individual in a position where things are done by rote. Preparing the individual for interviews is another area on which we focus. We promote the thought that the individual must be motivated, have a sense of purpose and have a clear head on what they can offer the potential employer. We will continue to provide work placement opportunities and urge other organisations to do so. They will find it a rewarding experience, providing they are prepared to invest time and resources in providing a positive experience for both parties. A positive step in developing your skills?